Special Summon 1 “Cyber Dragon” from your hand or GY. It cannot be destroyed by card effects. Cyber Revsystem may be the star of the new Cyber Dragon support. Monster Reborn for any “Cyber Dragon” in your grave, but it can also Special Summon from the hand. There are a host of choices that are “Cyber Dragon” in the hand or graveyard, so you won’t be losing out on finding a target, many of which have effects that active when summoned. The protection against destruction by card effects is something Cyber Dragons, or frankly any archetype would love to see in a archetype-specific card. The only Extra Deck Cyber Dragon-centric that can be Special Summoned by this card is the new Link monster: Cyber Dragon Sieger. A downer, but if Cyber End Dragon or Cyber Twin Dragon were considered “Cyber Dragon”, that would be ridiculous. This card is great for the archetype. To think of the lack of support and years later it gets a ton of it. Players only wish they could’ve had this kind of support when they played these cards heavily. Cyber Revsystem is the Return of the Dragon Lords for Cyber Dragon. Free Normal Spell Cards that are not once per turn. Revsystem Special Summons any Cyber Dagon from the hand or grave. Then anything Special Summoned by this effect cannot be destroyed by card effects. 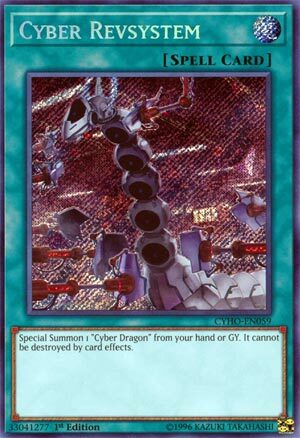 A bunch of cards count as Cyber Dragon in the grave, but it’s probably best to get the original and keep it on the field to take advantage of the immunity. This plus Torrential Tribute is funny. It’s searchable, free, and can have multiple uses per turn. Yeah you run 3 of these. Today we have a very simple, yet amazing extender for the Cyber Dragon archetype, Cyber Revsystem. Cyber Revsystem is a Normal Spell card, which makes it searchable by Cyber Dragon Core, which is searchable off Cyber Emergency which Cyber Dragon Core can also search, or you can search this if a Cybernetic Overflow is destroyed. When this card is activated, you can Special Summon 1 Cyber Dragon from your hand or GY and it cannot be destroyed by card effects. It does say specifically Cyber Dragon, but again many cards are treated as Cyber Dragon in the GY. Very simple effect yet it helps extend your combos in Cyber Dragons. This can get you a material for the summon of a Sieger or Nova, or maybe if you have a Sieger and enough field presence already, you can use what you revive and the Sieger for Summon Sorceress to help get materials for a Cyber Dragon Nova which can revive the Sieger. Revsystem isn’t a hard once per turn either, so you can use multiples to extend your combos to your heart’s extent. Revsystem is a great card for extending combos and is a must at either 2, since it is searchable, or 3. I honestly prefer 3. Art: 4.5/5 Herz is turning into a bigger Cyber Dragon now. Short and simple today, for a card as easy as this. Cyber Revsystem, about the only downside this card has it that it isn’t a Quickplay Magic card, though that might make it TOO good. Special Summoning a Cyber Dragon from your Hand OR Graveyard, and I believe this card itself is searchable too. Your Cyber Dragon is granted immunity to effect destruction from Revsystem as well, another bonus you don’t get from most revival cards. Another note of beauty to point out, that this card doesn’t fall victim to the ‘once per turn or only activate one’ clause most cards see. This makes it possible to swarm and extend, if you can get multiples at the same time, of course. In short, I like this, I like it a lot.